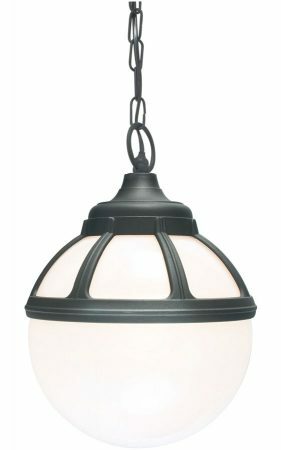 This Norlys Bologna hanging outdoor porch lantern in black finish with opal globe and rated IP54 is traditional and features period style. Manufactured by Norlys, a Norwegian manufacturer who offer an unrivalled guarantee of 15 years against corrosion. Made to withstand tough weather conditions – even in coastal areas were salt will normally corrode your outdoor lights. Featuring a ceiling mount, chain suspension and circular frame, with an opal polycarbonate globe shade containing a single lamp bulb. It creates a diffused all-round spread of light, which not only looks fantastic outside your front door, it creates a good light essential for those dark nights. If you are searching for quality outdoor lighting, this chain porch lantern should be considered. Fully weatherproof and supplied with a manufacturer’s 15-year anti corrosion warranty, which relates to the corrosion of finishes on aluminium lights like this one. Exterior fittings must have an IP (Ingress Protection) rating which indicates the fittings ability to prevent solids and liquids penetrating the enclosure. The higher the number, the greater the protection. The minimum rating for an outside light exposed to the weather is IP23. This fitting is rated IP54. Height adjustable at the time of fitting, please see the technical information below for dimensions. There are matching fittings in the Bologna black finish outdoor lighting range that can be found below. This exterior light is supplied by Elstead Lighting and manufactured by Norlys, a Scandinavian company with 50 years experience in the design and manufacture of exterior lighting designed to withstand tough climatic conditions, such as the Bologna hanging outdoor porch lantern in black finish with opal globe and rated IP54 you see here.